It is quite possible to say that this tool could be the most useful indicator for trading binary options. It is actually following trend indicator which is focusing on multiple linear model and predicting the price. It is basicly a tool with which you can predict where the price will go or be over certain period of time. It uses different type of analysis that is why it is useful when it comes to predicting future value. Since it has few similarities with MACD(Moving Averages) it is often called as Moving Linear Regression Indicator. It is more proper name when you see the tool since it acts similiar as MACD does. The tool is usually a standard with most of chart packages. First if you do not have it yet, i would suggest to download it and install it in your software, preferablly metatrader 4. Add the indicator to the rest of the indicators and select it from the menu. Afterwards it reads as moving average. But the formula behind this tool is quite more complex. When you will see the price is above the line of this indicator you will know it is an uptrending market and if it is below you will know it is a downtrending market. 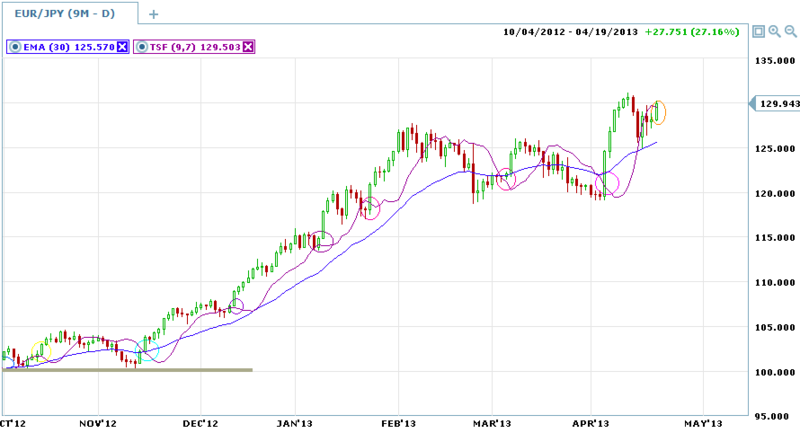 I would suggest to confirm the signal of this indicator with more then just one time frame just to be on a safe side. Problem i see is only that you need to set it up at first to give you good signals, this is something you need to figure out on your own, i would say to test it out first at demo and then apply to real account. But after the setup is done and you feel comfortable with it, it can be the best indicator for a beginner regarding binary options. It is an upgraded version of MACD and gives you more accurate results when it is set up. To get again into more detail as we said, it combines multiple linear regression lines and then it combines them to just one line. Test it and you will see it is great. As always, no tool is perfect and 100% so even if it is great you have to start using it with caution. Get comfortable with it is a must before you start trading it in real market otherwise you will have problems and lose money and i know you do not want that. After all, you want to learn this to make a nice profit so you can enjoy. I can’t download it. Do I need something like 7zip or Winzip to open it or do I have to have either MT4 or MT5 open so I can download it to either one? Or, is there some exact procedure you can tell me how to directly download it onto the MT4 site? I’m a compete newbie so i don’t understand tech stuff like this. Please help. Thank you!! !